Activision and Infinity Ward have finally revealed the Call of Duty: Infinite Warfare Zombies mode, titled Zombies in Spaceland. 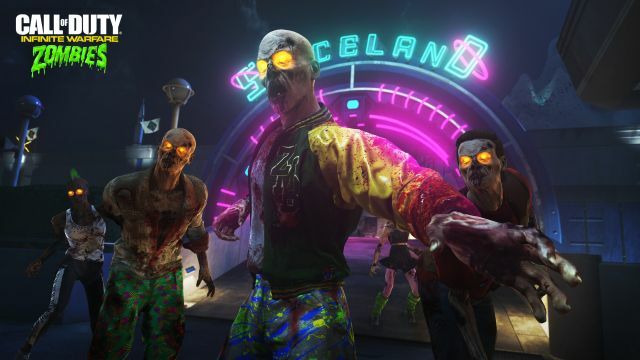 Zombies in Spaceland transports fans into an original, action-packed storyline where they’ll fight as one of four classic ‘80s characters, and battle the living dead in a space-themed amusement park full of deadly zombies, fun attractions and much more. Assembled by director Willard Wyler, portrayed by Paul Reubens, the four playable characters include Andre the rapper (Jay Pharoah), Poindexter the nerd (Seth Green), Sally the vallery girl (Sasheer Zamata), and A.J. the joch (Ike Barinholtz). Additionally, players will encounter an enigmatic DJ in the theme park, portrayed with voice and likeness by David Hasselhoff, who will be an invaluable resource as they try to get out of this horror movie alive.